If folk put as much effort into delivering a digital britain as they do into delivering their statistics we might actually get somewhere. As it is all we have is an old boys network using weasel words to cover up a growing digital divide caused by other old boys. Churchill could make statistics say anything he liked, and so can the telcos. We need men of fibre. Not men of weaselwords paid for by a massive marketing budget. Pity I can’t give you 5 stars and oodles of ‘likes’ with this WordPress theme, Chris! 2014 will bring new opportunities to use the digital britain we’ve got as best as we can! At least we want to die knowing we’ve done our best, right? Weaselwords indeed as all ANALysys Mason’s statistics are based on % premises passed, not the actual speed available at each premise. Using BT’s VDSL/FTTC profile 17a, 95% coverage at 30Mbps means a cabinet approx. every 1900m. In addition the (VDSL) capacity of the cabinets need to support the number of premises/subscribers connected to it. This hasn’t happened in the BT & BT/BDUK rollouts I’ve seen! AN report says ‘In this report, superfast broadband means fixed connections with downstream bandwidth of at least 30Mbit/s.’ So are based on speed at premises. FTTC cabinets are added if first fills up. 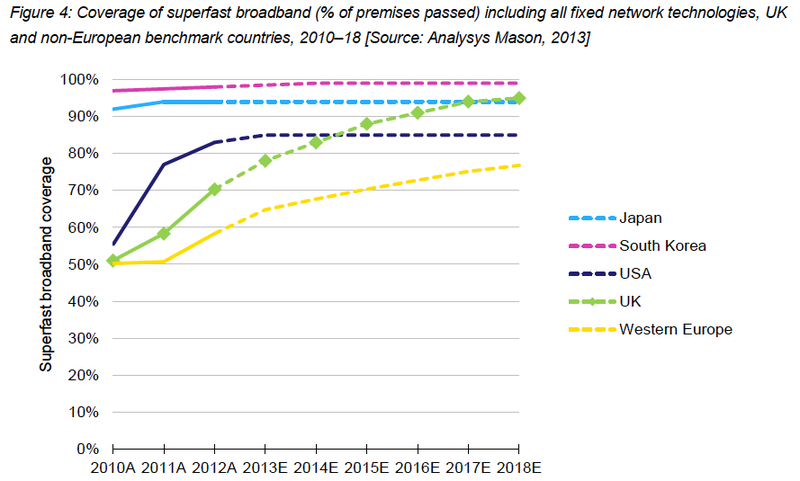 Which gets us nowhere close to the Japanese, and which means we can’t flex the network as easily as countries that are putting in FTTH, like most of of northern and eastern Europe. Note that when subscribers have access to high speed symmetrical services, what they do online changes; they upload a lot more, helping cloud and hosted services lower their input costs and be more competitive. No wonder UK start-ups are headed for the exits. Please explain ‘flexing the network’ and how it differs between FTTC and FTTP when it’s the same core network. Any examples of UK start-ups heading for the exits? The iOS 7 update showed that the core is limited too. The access network is a bottle neck, as is the asymmetry, which encourages throttling and stops me from experimenting with large files and certainly make uploading >1Gb file a chore and a bore. As to exits, read the FT for news about all the little hot-shops from Autonomy down that have sold out. Bu you should worry more about all those who could or would have started something here, but couldn’t be bothered because of the hassle and cost of dealing with BT and other red tape. But how many start-up businesses are failing or leaving the UK because of broadband? Is that what caused the Autonomy events? I doubt if a business says it won’t start up or move to the UK because of BT compared with all the other things like staff, premises, other services, rates, tax, skills, marketing, product, sales etc. Plus there are over 100 telcos with code powers to choose from. The non-availability of adequate broadband for business is a hygiene issue, a box tick. If it’s inadequate, entrepreneurs go elsewhere. Ask Mike Kiely and his customers in Shoreditch, some of whom decamped to Dublin, not least because BT wanted each company in the complex to buy a leased line rather than let them aggregate demand on a fibre service.. There may be 100 firms with code powers; Ofcom says that outside London BT has a monopoly on >1Gbps links. Funnily enough, TalkTalk and others say 80% of the customers on FTTC links are BT’s. Do you think that means VULA is working? As you know Ofcom is looking into a TalkTalk complaint that BT is running an illegal margin squeezeon its wholesale fibre services. Surely Shoreditch is in the VM business area. Even in Somerset I see green duct going into new build areas linking in to the VM network even through it’s not a VM residential part of the world. Tesco use C&W (as was) and installed duct into a Tesco store. Mike says VM are 500m from Perseverance so couldn’t they provide a service? Interesting that he notes the issues of a single supplier. Sky and TalkTalk have only recently upped their advertising which should increase their take-up. As you suggest, in a duopoly, both parties behave like monopolies. As the UK energy business shows, even six “competitors” isn’t enough to ensure a competitive market. Whether Sky and TalkTalk win more customers, it’s all the same to Openreach. Future 50 in UK was designed to move tech startups to listed companies (read more in FT here: http://www.ft.com/cms/s/0/c2671634-5dc1-11e3-b3e8-00144feabdc0.html#axzz2n3yiKfNt). The article refers to Japan, not Singapore. However Singapore, which has the world’s highest percentage of millionaires and four out of five Singaporeans live in subsidised, high-rise, public housing apartments is somewhat different to the UK. The startup list is specifically about companies growing in the last 5 years, not those started since. Like Raspberry PI? What needs to be put in place to get a level playing field in each of these areas? I would say “honest money”. The UK precedent is the ‘Bradbury Pound’ of 1914: interest-free ‘treasury money’ – just as the US Greenbacks. On the government level that is. On the techno-people level, I’d LOVE to see ‘mutual credit’ via mobile phones. First, you need to define a ‘level playing field’. For power is it realistic to have more than one connection of gas, electricity (and the same for water and drains) into each property? Are you saying BT is a utility? In that case I look forward to your advocacy of a universal service obligation on BT for broadband. In any case you undermine your own argument. “Power” is to electricity and gas as “Communications” is to voice and data. Simply asking Sabine what a level playing field would look like to us in the areas of banks, comms and energy. Particularly power where it is exactly the same gas that comes out of the pipe whoever you buy it from.